Residents of Osceola County (FL) welcomed Adam Putnam, candidate for governor in the 2018 election, at an "Up and Adam" breakfast at the Elks Lodge on Kings Highway in Kissimmee on August 23, 2017. Osceola GOP Chairman Mark Oxner introduced the speakers, including State Committeewoman Tammy Celeste (prayer), State Committeeman George Jackow (Pledge of Allegiance), and State Representative Neil Combee, who introduced Adam Putnam. Putnam is a lifelong resident of nearby Bartow (Polk County), served 4 years in the Florida legislature, 10 years in the U.S. House of Representatives, and is currently Florida State Commissioner of Agriculture (elected in November 2010). He is running on a platform that can be summarized as "Florida First," intent on providing residents of Florida and other states with an optimum environment in which to pursue their own American Dream. 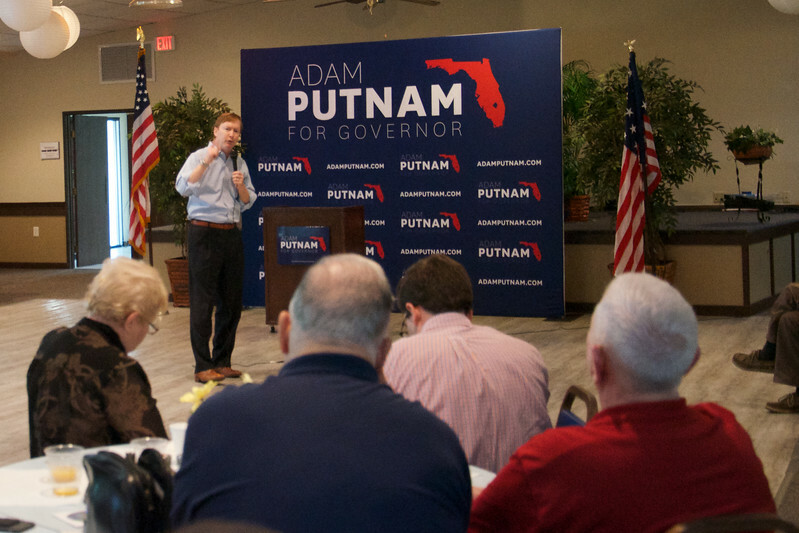 Website: http://www.adamputnam.com; Facebook: https://www.facebook.com/pg/adamputnam/. Images in this gallery were captured by Jim Siegel, Osceola County resident, member of the Osceola County Republican Executive Committee, business consultant, and professional freelance journalist ... jim.siegel@mac.com. Downloads are permitted for personal and campaign purposes.